Cally Spooner, And You Were Wonderful, On Stage, 2013. 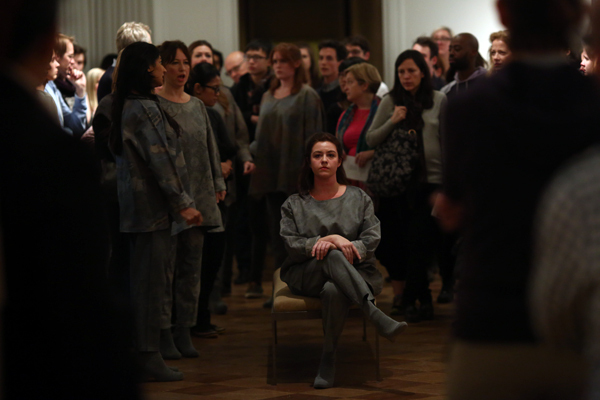 Performance view, National Academy Museum, New York, November 2013. Photo: Paula Court. My first venture was British artist Cally Spooner’s And You Were Wonderful, On Stage, an a capella musical performed November 8–10 by fifteen women at the National Academy Museum. Spooner, in collaboration with composer/arranger Peter Joslyn and choreographer Adam Weinert, explores the fates of the live voice when spun through contemporary media mills. The lines of the sung text were clipped and stitched together from news articles that sensationalized certain celebrity slipups and/or downfalls caused by dislocated tongues: Beyoncé’s admission that she lip-synced the National Anthem at Obama’s inauguration; the announcement that Obama’s speechwriter, Jon Favreau, would be leaving the White House to write Hollywood screenplays; Lance Armstrong’s apology on (or is it to?) Oprah for lying about his use of blood doping and performance-enhancing drugs. Spooner’s program notes explained that the piece articulates “a loss of live delivery, which has grown as a result of technical dependency, and a resultant ‘making technical’ and ‘grammatization’ (to use Bernard Stiegler’s term), of behavior and language; a ‘making technical of life.’ ” (Phew.) True as that may be, the piece possessed far more cheek than bite, and ultimately illuminated little new about the perils of our mediated culture. Does technology only make regurgitating dummies of us all? I wanted Spooner to dig more deeply into the complexities of the problem rather than cartoon its supposed effects. Then again, with members of the audience incessantly holding up their smartphones to record the living, breathing, fleeting moments happening right there in front of them, perhaps her point was duly made. Rosa Barba, Subconscious Society – Live, 2013. 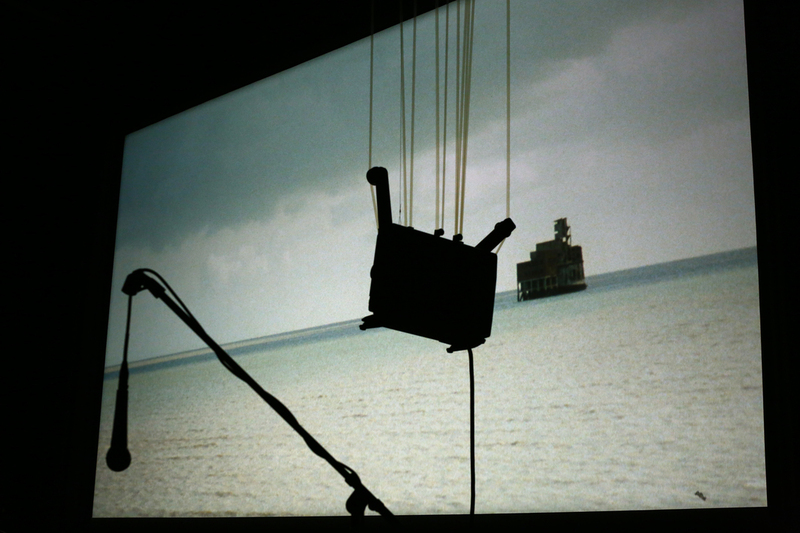 Performance view, Anthology Film Archives, New York, November 2013. Photo: Paula Court. Italian artist and filmmaker Rosa Barba also wrestled with questions of liveness in her screening/performance at Anthology Film Archives (Nov. 14–16), Subconscious Society – Live. I’ll admit to experiencing a geeky rush walking into the theater and seeing multiple projectors and screens, microphones strung over the seats, and sculptures installed front and center. Where Hollywood prides itself that the 3D blockbuster has restored moviegoing to an event, Barba seemed to be offering a rounder ambition for the ways in which a movie theater can expand and blur the lines between space and screen. When the lights went down, so began a whirlwind of projected text, moving image (35 mm and 16 mm), live music, and voiceovers, all articulating ideas about memory, history, the subconscious, utopia, architecture, nature, nostalgia, and more. (Or at least, I think so.) The sculptures whirred, spun and lit up, punning the mechanics of cinema; images of unidentified structures, people, and lands flew by—literally, at one point, in the form of dazzling helicopter shots over a colorful terrain. Confusion soon set in, and what appeared at first to be a poem or incantation of sorts quickly became a ponderous jumble, overburdened by a desire to accomplish so much all at once. For all the complication, there were also oddly reductive gestures: a single strip of celluloid hung inside each of the three sculptures below the movie screen, one of which was printed with the word RED, another YELLOW, and the last BLUE—the RYB shtick that’s been used before by many film and video artists and never once to great effect. Nevertheless, I couldn’t shake the initial promise Barba’s theater held—for that of a “performed cinema”—and I walked out looking forward to a future piece, one that’s in sharper focus. Jérôme Bel, Disabled Theater, 2013. Performance view, New York Live Arts, November 2013. Foreground: Remo Beuggert. Photo: Paula Court. “Jérôme asked the actors to make a dance solo,” we’re told, and we then watch as seven of the actors perform a dance of their own design. (The other three were given their chance later in the show.) Of particular note: Remo Beuggert’s clever choreography with a chair, Miranda Hossle’s hip-hop moves to the rhythms her colleagues beat out on drums and tambourine, and Häusermann’s impassioned interpretation of Michael Jackson’s “They Don’t Care About Us.” The actor’s performances range from compelling and poignant, to strident and funny. “I’m not happy with the solos,” Gianni Blumer tells us. “I was very angry not being able to dance. I’m the best dancer, and I want to make the audience laugh,” which he then does by blowing a loud raspberry into the microphone. The terrible flaw of the show—and part of the reason it has polarized audiences—is that it relies to a great degree on the hollow economies of provacatourism. For all of the potent questions it raises about who and what is typically excluded from cultural production—from our narratives, both mainstream and avant-garde, and from our understanding of beauty and art—Bel’s conceptual framework proves to be a soft, sanitizing strategy, quarantining the performers in a way that preserves a theatrical status quo. Prompting audiences to examine their assumptions about these subjects also assumes that we are ignorant, inexperienced, or somehow limited in our abilities to play our part. It would have been a far stronger and more powerful choice for Performa to invite Theater HORA—a troupe who has been creating theatrical productions since 1993—without Bel’s mediation so that we, performers and audience alike, could deal with each other more directly. Jennifer Krasinski is a writer based in New York. Performa 13, the fifth biennial of new visual art performance, runs through Sunday, November 24 in New York.